BALTIMORE–(BUSINESS WIRE)–The journals of Cell, Nature and Science are well-known as the world’s leading journals and authoritative publishers in the field of life and natural sciences. Among them, Cell and Science are from the United States and Nature is from the United Kingdom. The publications in the three major journals or affiliated journals are mostly top-quality and high-impact papers that have been reviewed by top-notch experts and revised multiple times, representing the highest level of scientific research. For many professional researchers, having a paper published in one of these journals is their common dream and assiduous goal, as it does not only mean that their research results are acknowledged across the world, but also is a necessary step to get themselves independently and well-established in their research field. Since he became a scientist in life research, Dr. Chunyu Zhang, principal investigator of the Lung Cancer and Aging Project at Sidney Kimmel Comprehensive Cancer Center of the Johns Hopkins University School of Medicine, has published a host of papers on research results in international top journals, covering a number of important research areas such as embryo development and implantation, immune regulation, cancer and aging. Looking back on the journey of his research on aging and cancer in the past 20 years, Dr. Chunyu Zhang said that it is key to persist and never give up in the entire process of doing research. From being interested in exploring life forming and longevity secret, stepping into the research field of anti-aging and anti-cancer, to the ultimate stage that generates notable outcomes. Even when one is lacking research funding, one should never forget his original intention and stick with it. “The word ‘research’ composed of ‘re’ and ‘search’, means a long-term process of repeated search that entails the devotion of time, energy and financial support, not happening overnight. To publish a paper in Cell, the editorial department won’t consider it until you can prove that the same conclusion is drawn after being tested repeatedly through different angles and by using different means, otherwise it will be rejected without an excuse immediately. Only high-level papers that are produced after long-term research and bolstered by mass amount of data are likely to get the editors’ consent to pass on to three peer experts for review. At this stage the manuscript still needs to await opinions from the panel on modification and supplementary experiments to meet the publishing requirements. Due to the large number of incoming manuscripts and limited publishing space, even those that meet the requirements may not be accepted for publication and have to be turned to another journal,” Chunyu Zhang said. 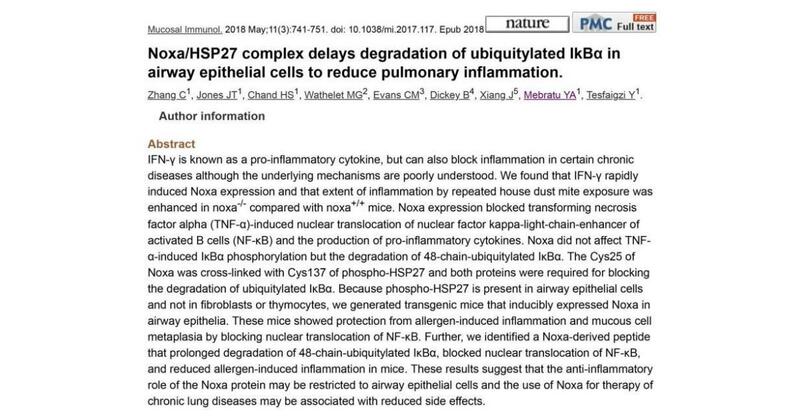 Recently, Dr. Zhang, as the first author, published an elaborative research paper in Nature on mucosal immunology, which reveals at the molecular level how a protein and its small peptides could precisely treat chronic lung inflammation with fewer side effects. As an important coauthor, he published a research paper in Cell Death & Disease from Nature Publishing Group, demonstrating that ceramide generation underlies the Akt inhibition and cytotoxicity of lipid-based Akt inhibitors on Akt highly active cancer cells, and suggests nanovesicle shedding and uptake might potentially propagate their cytotoxicity in vivo. A paper that Dr. Zhang participated and made crucial contributions was published in Cell, demonstrating a telomerase-binding protein inhibits telomerase activity to shorten telomere length and shows antitumor in vivo. In addition, Dr. Chunyu Zhang also published approximately 30 papers in international top journals and professional core journals, including PNAS, Genomics, Science Bulletin, Reproduction, Immunogenetics, Cancer Research, Clinical Cancer Research, Carcinogenesis, Molecular Cancer Therapeutics, PLoS One, Free Radical Biology & Medicine, etc., with 168 cumulative impact factors and 1,886 citations in total. Dr. Zhang has also been invited to give more than 30 lectures, reviews and conference reports. Dr. Zhang has repeatedly stressed that the top journals serve as merely publishing platforms. For scientific research, the most important part lies in the content and the quality of research work itself. “Persistence + Inspiration + Opportunity”, each being indispensable, is Dr. Zhang's secret recipe for doing research. Hard work pays off, and years of anti-aging and anti-cancer research results have finally been transformed into the industry’s eye-catching product – ROVIDIUM. The product has been officially launched in the US this August. Chinese consumers can now purchase on many cross-border ecommerce platforms such as Suning Overseas Shopping and Xiji. This product fully integrates the research results of Dr. Chunyu Zhang. By harnessing the tumor suppressor gene and the endogenous longevity transcriptional factor, it gives play to the synergy of various factors so that normal cells are well protected while cancer cells destroyed. As a solution for both aging and cancer, ROVIDIUM applies an entire new mechanism as core technology, no parallel products can be found in the international market yet. Dr. Zhang is also highly meticulous about the production process. The core ingredients come from high-purity active raw materials instead of crude extracts, including rice germ and rice bran extract Ceramide, turmeric extract Curcumin and green tea extract EGCG, all from natural foods. The raw materials are selected from well-known suppliers of Japan, Germany, China and the US. The ingredients are evaluated by the US FDA as “Generally Recognized as Safe” (GRAS). With high-tech purification and micro-active encapsulation, ROVIDIUM features excellent purity, sustained-release stability and bioavailability. It’s produced and packaged by a selected Californian partner in accordance with the cGMP standard and above, all of which ensure that the product can inhibit cancer cells at regular doses instead of high doses. According to Dr. Zhang, ROVIDIUM has launched both core and luxury versions in order to match different needs. The luxury version also contains COQ10/PQQ, a mitochondrial patented combination, and a specific proportion of Vitamin Bs that fight against acute damage and inflammatory response of haze particles. In the future, more in-depth innovation will be made on ROVIDIUM by combining the latest international research results. Trials will be carried out to improve the body’s metabolic level while reducing brain cancer risk by adding NAD+ and its precursor molecules NR or NMN. “The road to research will never end. We must always be vigilant, keep moving forward and stay ahead,” said Dr. Chunyu Zhang.